Naiads are nymphs that are associated with brooks, springs and fountains. The word ‘naiad’ means ‘alloted to swimming’ from Indo-European ‘sna-‘, ‘To swim’ and ‘ai-‘, ‘To give, allot’. The concept of Naiad would seem to have come from the Caucasus with the Indo-European culture when they formed the Mycenean Cylture on the mainland of Greece. 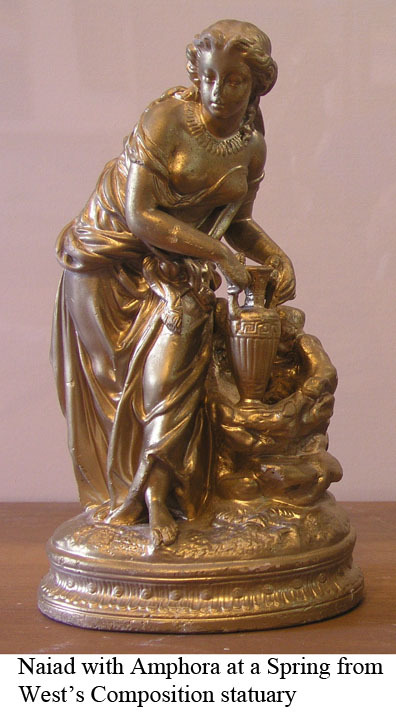 <–Naiad, a goddess of brooks, springs, and fountains in Minoan attire. we are beautiful-haired nymphs, daughters of aegis-holding Zeus. In would seem that in the primitive cultures before the ancient Greek that resources were assigned to women. This might have been their dowery to make them more attractive to marriage. The word ‘nymph’ really only means ‘maiden’ though it came to apply to a goddess. Though they were considered goddesses they seemed to be of lower status and may have been mortal. The suggestion is that their lives were tied to the existence of their resource. Further there seems to be a heirachy of the deities with the Naiads in the lower ranks. This is suggested by the following from Homer Odyssey , 10.345, “But her handmaids meanwhile were busied in the halls, four maidens who are her serving-women in the house. Children are they of the springs and groves, and of the sacred rivers that flow forth to the sea, and of them one threw upon chairs fair rugs of purple above, and spread beneath them a linen cloth; another drew up before the chairs tables  of silver, and set upon them golden baskets; and the third mixed sweet, honey-hearted wine in a bowl of silver, and served out golden cups; and the fourth brought water, and kindled a great fire beneath a large cauldron, and the water grew warm.” Circe is the lady and she has four handmaids who are Naiads to serve her. There are many Naiads who report being raped by the higher deities. If they were of higher status or more powerful they might be able to resist being raped as Athena resists Hephaestus. In fact their status may be so low that they are mortal. The suggestion is that their existence may be dependent upon the resource that forms their realm. Abarbarea — the wife of Bucolion, a son of the Trojan king Laomedon. Aegina — daughter of the god of the Asopus River. Callirrhoe — daughter of the Achelous River. Callirrhoe — a daughter of the Scamander River in the Troad. Her husband was Tros after whom Troy was named. Castalia — The sacred spring of Delphi lies in the ravine of the Phaedriades. Daphne — daughter of the Peneius River in Thessaly and Creusa. Ismene — daughter of the Aesopus River and Merope. The spring of Ismenos was near Thebes and formed the focus of the Temple of Apollo Ismenios. Lilaea — a daughter of Cephissus, from whom the town of Lilea in Phocis derived its name. Question: What do you think do the nymphs wear? I am going to act Oenone, and she is a water nymph, I dont what to wear. pls. help. tnx. Answer: The classical Greeks thought Nymphs wore a peplos because that is what their women wore. They also said the goddesses wore garments of gossamer. You could try a silk peplos. I think lightly knitted silk might be close to gossamer. But I have been admiring a tennis outfit for women in the pro shop where I play tennis. This outfit has layers of light material that would move with the body underneath (Adidas Wimby). I think today a water nymph might easily be seen in such an outfit. You can also go to a halloween costume shop and get a goddess outfit.